Hotate / ホタテ = scallops. Shio / 塩 = salt. Bataa / バター = butter. 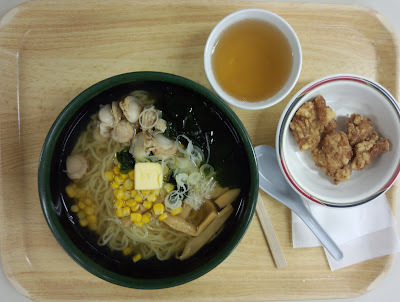 420 yen from the cafeteria, plus 126 yen for the karaage. The cafeteria translates it as "Shio (salt-based soup) ramen with scallops." Hmmm, no mention of the butter. But yeah, there's butter on there, and corn, leeks, wakame / わかめ / a certain kind of seaweed usually seen in miso soup, and lotus roots. Not the greatest, but it's not bad at all. I think the butter helped. But ramen with butter? Think of it this way: it's a normal ramen with buttered corn. :D Oh, and yes, corn.